Trainer Chris Waller’s well bred filly Fiesta is primed to celebrate her Golden Slipper claims when she resumes in the Group 3 $150,000 Widden Stakes (1100m) at Rosehill on Saturday. Into The Abyss, above, is among the nominations for the Widden Stakes at Rosehill. Photo by Steve Hart. Fiesta is one of sixteen two year olds nominated for the Widden Stakes and is currently marked at $34 for the Group 1 $3.5m Golden Slipper Stakes (1200m) at Rosehill on March 24. A good performance from the I Am Invincible filly will see her climb up the Golden Slipper market order at Ladbrokes.com.au who have the Magic Millions 2yo Classic winner Sunlight as the $6.50 favourite just ahead of Fiesta’s stablemate Performer at $8. Fiesta has been to the races twice for a third in the Listed $150,000 Keeneland Gimcrack Stakes (1000m) at Randwick on September 30 followed by second in a 1000m two year old plate at Randwick three weeks later. Waller’s stable manager Charlie Duckworth said that Fiesta’s work alongside of Performer has been good and he expects a forward showing from the filly in the Widden Stakes. 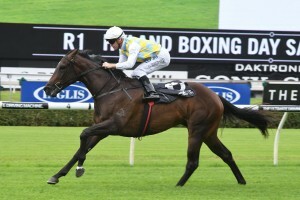 “She’s very sharp and has worked with Performer,’’ Duckworth told Racing New South Wales News. More than half of the fillies nominated for the Widden Stakes have race experience but only the John Thompson trained Into The Abyss has saluted the judge in first place with a win in a 1000m two year old maiden at Randwick on Boxing Day.